We’ve been busy picking pumpkins, visiting family, CAMPING, pulling out the sweaters, sanding and finishing furniture, weeding, mowing, planting kale and beets and brussels sprouts… Clearly September was a busy. Some friends bought a boat earlier this summer, and arranged a group camping trip a few miles off the shore on one of the barrier islands. It something special to set up a tent on a deserted island, watching the sun set over the water in the west and rise over the water in the east! Throw in a huge pot of seafood & tomato chowder, and a moonlight exploration of an abandoned fishing trawler, and I can hardly think of a better camping trip. But of course traveling, camping and the glorious reappearance of sweater weather isn’t all that happened in September. What is another month without preserving. There were lots of goodies coming from our garden and fresh plums from the pick-your-own farm. The September canning roster included: Plum Jam. Asian Plum Sauce (like Hoisin…). Pickled Peppers + Carrots. 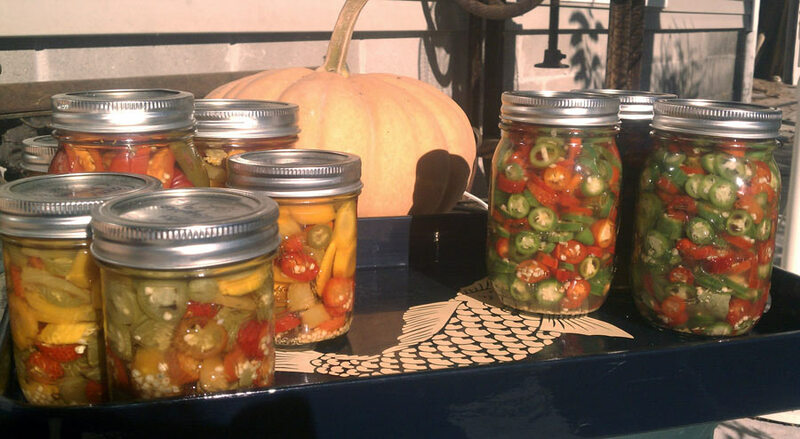 Refrigerator Pickled Peppers. 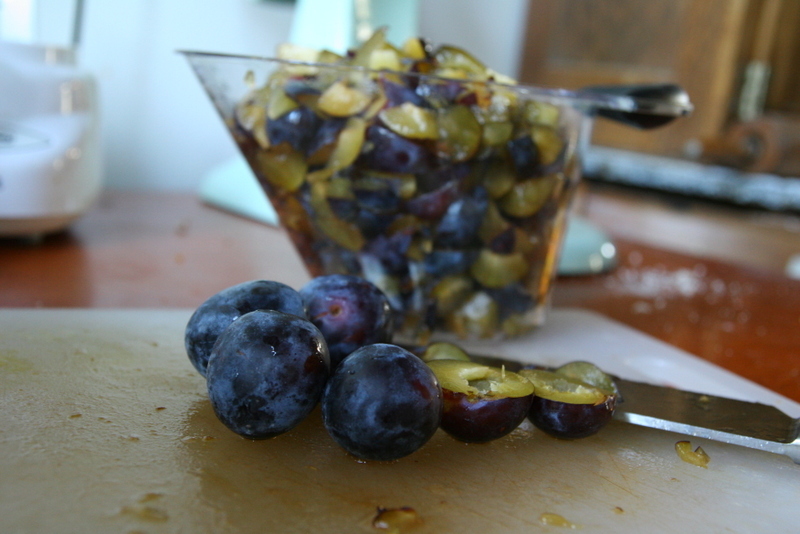 The freezing roster included: Halved Damson Plums (for cobbler in January…). Roasted Sweet Peppers. More Cherry Tomatoes. Roasted Eggplant. Start a big pot of water boiling. Sterilize the jars (either in the boiling water, dishwasher, or in a 250 deg. oven for 15 mins). Prepare the brine by bringing the vinegar, water and salt to a boil. Keep this hot on low until ready to fill the jars. Slice the jalapenos and carrots to your liking. Then add the spices the sterilized jars, following with the peppers and carrots. Divide these evenly among the jars so you have a ratio of carrots to peppers as you like. Finish by pouring the hot brine over to fill – leaving 1/2 inch headspace, and tap to release any bubbles. This should be enough brine for 4 pints if you filled your jars pretty full with veggies. You may need to stick a chop stick down in the jars to make sure there are no bubbles trapped anywhere. Wipe the rims clean with a towel dipped in hot water, then add the new lids and bands, and process in the hot water bath for 10 mins. 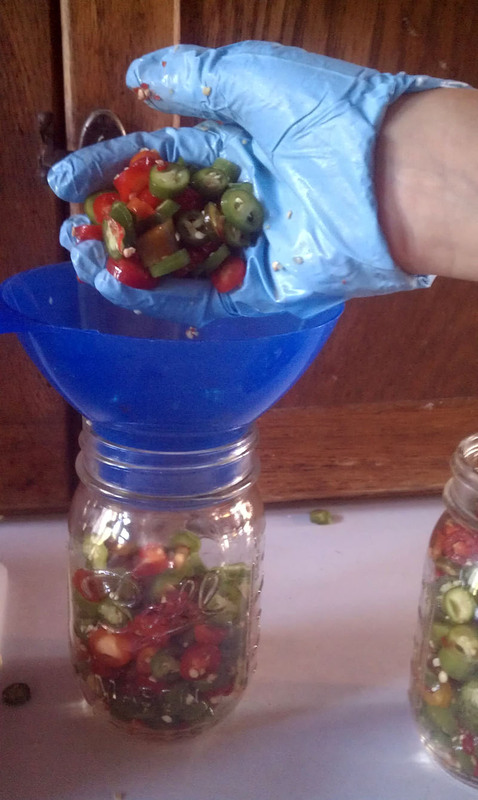 Or, if don’t have the whole canning operation you should definitely try the slightly sweet quick pickled Refrigerator Pickled Peppers, no processing required! You can use an old mayo jar or whatever you have on hand. Pop a lid on the jar, allow to cool and keep them in the fridge for up to a month or so. These barely sweet peppers are soo delicious – I’ve put them into pasta sauce, on a sandwich, sprinkled over roasted potatoes, scrambled into an omelet….the possibilities are endless. Oh yes, gloves were essential! I’ll be sharing the details of the furniture business here very soon…just putting on the final polishing touches to the website! Great pickles turotrial here! 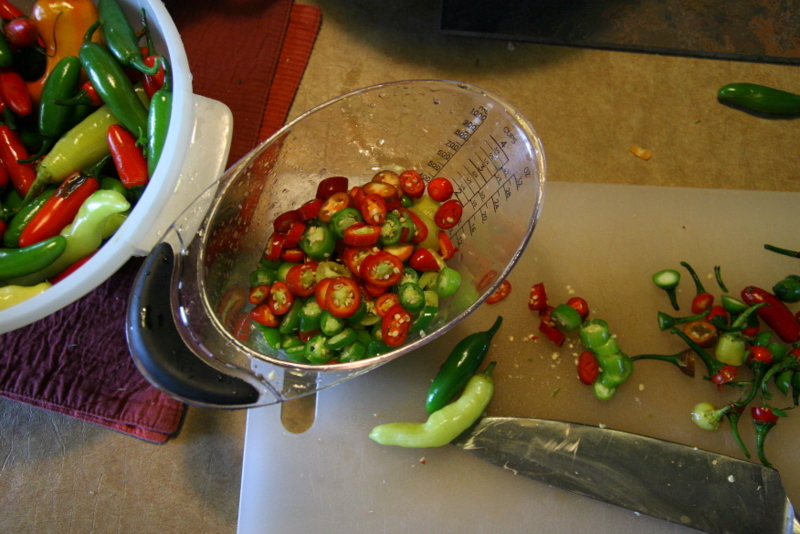 Wondering, do you wear the rubber gloves so that the hot jalapeños don’t burn your hands / is it nec. to wear them? Also do you have a blog / website for your furniture production business? (We need some expert cabinetmaker-advice on how to shorten some tricky table legs: there are 3 table legs underneath our huge, ornate round table in our livingroom, and everybody sits too low at it., even adults! It’s heavy as all get out. An antique, somebody has suggested that we sell it and buy another table that we like better. I can send photos. Glad to see your blog is back! Wow, your photography is so excellent — makes me want to reach into the picture and taste things. Your camping trip sounds beautiful. How was the camping in NY state in Sept? See any goodstuff? It was good to see you two at the b’nai mitzvah.